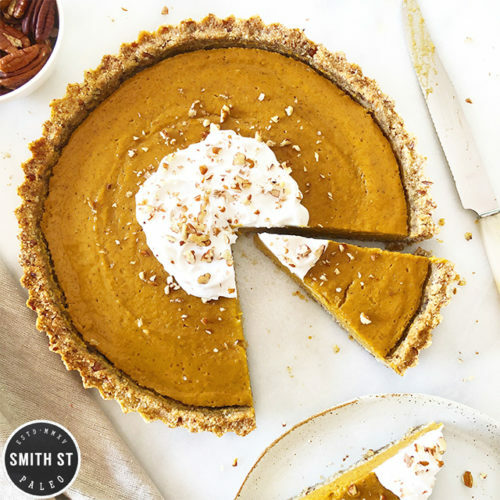 I don’t celebrate Thanksgiving, but I can definitely get on board with the theme of all things pumpkin, especially in pie form. What genius decided to put a vegetable into dessert? I’m banking on the same hero that went “I’m baking a cake. I have no chocolate. This carrot will do the trick”. They were either a culinary genius or high AF and had the munchies. Speaking of culinary genius, ahem, I’ve whipped up an absolute delight here, minus all the sugar, dairy and flour, so I guess you’ll be giving thanks to me because you still fit into your jeans after the holiday. You’re welcome pilgrims. Prepare the pumpkin. Peel and cut into small dice, about 2cm squares. I find steaming the pumpkin in the microwave for 10 minutes the best method as it doesn’t get too soggy. You want it soft enough that it will make a smooth puree, but not waterlogged. Prepare your pie dish. I used a metal pie dish that had a loose base of 20cm. These are great as the pie comes out of the dish completely and you can put it on any serving plate you want, easily cutting it into neat slices. I lightly grease the pie tin and cut a circular piece of baking paper to fit in the bottom. A regular pie dish will also work though. Quickly whizz the pecans in a food processor to a rough crumble, just a little chunkier than the almond meal. In a bowl mix together the crumbled pecans along with all the other dry ingredients and combine. Add in the wet ingredients and mix together well. Tip into the prepared pie tin. Press the mixture onto the bottom and sides of the tin, compacting it to an even thickness and even height up the sides. Bake in the oven for 10 minutes. Remove from oven and lower heat to 160 degrees. While the crust is cooking, puree together all the filling ingredients in a food processor until smooth and creamy. When the crust is removed from the oven, pour in the filling, then put back into the oven at the lowered temperature for 30 minutes. Remove from oven, let cool, then chill in fridge.